quirky - a guide to San-X and characters: Chibi Moomo. Literal Translation: Little Moo Moo. 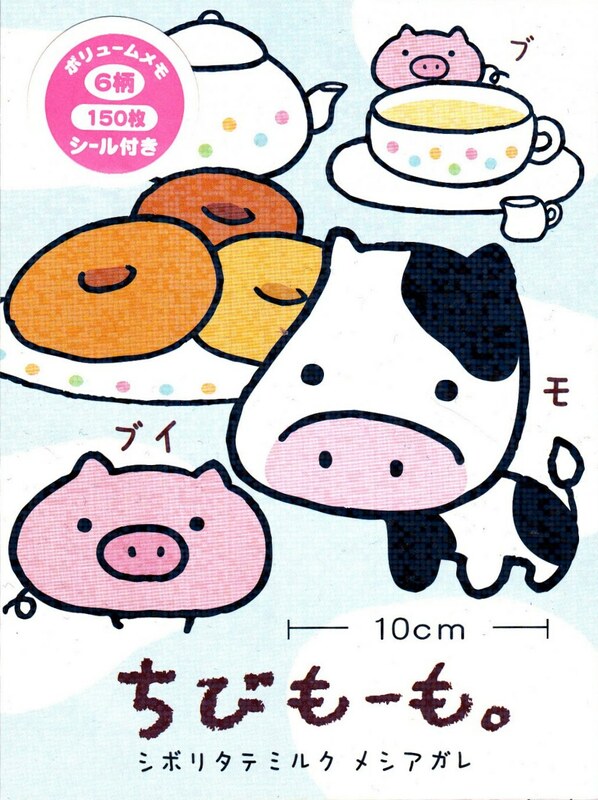 This cute 10cm cow and pig seem to like donuts! 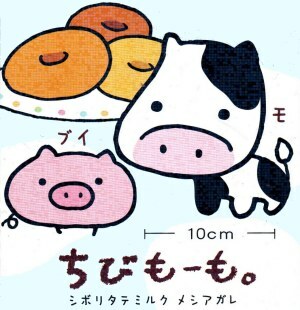 Above the pig it says "bui" for "bu bu" (sound pigs make in Japanese) and the cow is saying "mo" for "moo moo". Japanese people love everything fresh so they will love this fresh squeezed milk. Meshiagare ne! "Shiboritate milk" (搾りたて牛乳) is fresh squeezed milk right from the cow that hasn't been pasteurized yet. "Meshiagare" (召し上がれ) is a common Japanese phrase meaning "eat up!" or "help yourself!"